her ‘tiels were by far the most snuggly birds she had. Sokka and Boo certainly live up to that! Giving scritches reinforces the bond between you and your ‘tiel. By “preening” our cockatiels, we are behaving more like a close member of the flock, mimicking a natural show of affection that the bird can recognize. A bird that allows and asks for scritches is showing a great deal of trust in you. Giving scritches helps with molting. Those brand-new feathers wrapped up in a sheath (known as “pin feathers or “blood feathers) that show up during a feather molt are very sensitive. As the feathers mature, that keratin sheath flakes off, and can be very itchy and uncomfortable for the cockatiel (hence all the grumpy-ness during molting time). By giving our ‘tiels scritches, we are helping our birds feel better by rubbing the keratin sheaths off where they can’t reach. A quick word of caution: experts generally recommend that you avoid petting your cockatiel on the body, especially under the wings and on the lower back. For one thing, this is unnatural behavior for cockatiels (they only preen one another on the head), and most do not like their body touched at all. Also – and more importantly – this can sexually stimulate your bird, which can cause surges of hormones that make males territorial and aggressive, and can make females want to lay eggs, which in turn can lead to health problems – laying eggs is extremely draining for a cockatiel hen. fear of human hands especially will hesitate to allow pets on their head. Developing a strong bond of trust with your ‘tiel is the best starting point to having a bird that wants scritches. 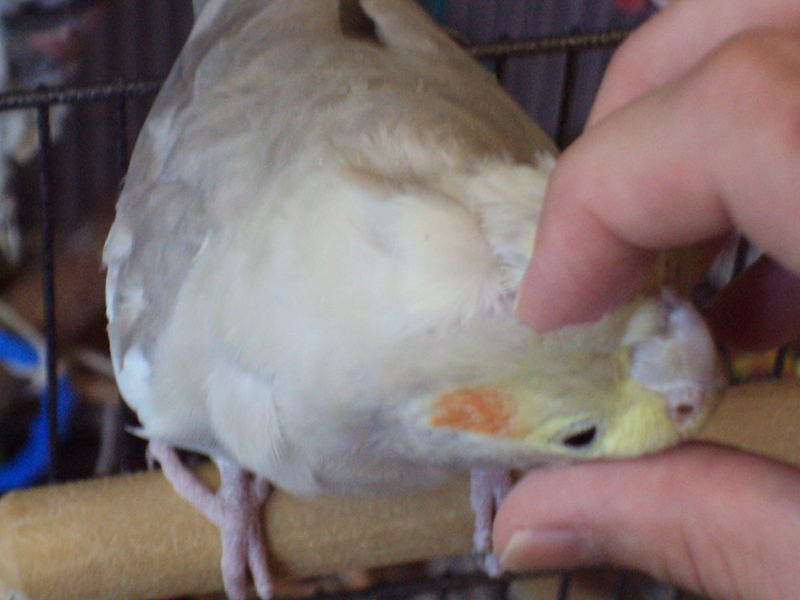 The picture here is of Boo, our female cockatiel, receiving head scritches. She LOVES getting her cheeks and chin rubbed!